A “modern day master” and often the “highlight of the program” (The New York Times), Robert Paterson is praised for his elegance, wit, structural integrity, and a wonderful sense of color. Paterson was named The Composer of The Year from the Classical Recording Foundation with a performance and celebration at Carnegie’s Weill Hall in 2011. His opera album, Three Way was Grammy® Nominated for the 2019 Awards, and his orchestral work, Dark Mountains, was featured on in 2018 on National Public Radio on Performance Today, with JoAnn Falletta and the Buffalo Philharmonic. His works have been played by the Louisville Orchestra, Minnesota Orchestra, Delaware Symphony, Austin Symphony, Vermont Symphony, Buffalo Philharmonic, BargeMusic, California EAR Unit, American Modern Ensemble, Ensemble Aleph in Paris. Recent performances include the world premiere of Ghost Theater, commissioned by the Albany Symphony’s Dogs of Desire. Vocal highlights include the opera, Three Way, premiered by the Nashville Opera in 2017 and then at BAM in Brooklyn, co-produced by the Nashville Opera, American Opera Projects and AME. Other premieres include the New York Premiere of his opera The Whole Truth with a libretto by Mark Campbell in 2016, Walt’s America for orchestra and chorus by the Gulf Coast Symphony in 2015, as well as commissions for Moon Music by the Claremont Trio and Graffiti Canons by the Volti choir in San Francisco. His string orchestra work, entitled I See You was performed by an all-star orchestra conducted by Delta David Gier, with the Jack Quartet, Del Sol Quartet, PUBLIQuartet and American Modern Ensemble in 2015. In Aspen, Shine received its world premiere by the American Brass Quintet and continues to be performed at Juilliard, Princeton, and on their national tours. Having written over eighty works to date, Paterson has received accolades and won awards for his works in virtually every classical genre. His awards include the Copland Award, a three-year Music Alive! grant from the League of American Orchestras and New Music USA, the American Composers Forum, the Utah Arts Festival Commission Competition, Cincinnati Camerata Composition Competitions, two ASCAP Young Composer Awards, and fellowships include Yaddo, the MacDowell Colony, the Aspen Music Festival, and the Atlantic Center for the Arts. Born in 1970, Paterson was raised in Buffalo, New York, the son of a sculptor and a painter. Although his first love was percussion, he soon discovered a passion for composition, writing his first piece at age thirteen. In the late 1980s, Paterson pioneered the development of a six-mallet marimba technique. He presented the world’s first all six-mallet marimba recital at the Eastman School of Music in 1993, and released the first-ever album of six mallet music, Six Mallet Marimba in 2012 (AMR) to a sold out crowd at the Rubin Museum in Chelsea, NY. In 2005, Paterson founded the American Modern Ensemble (AME), which spotlights American music via lively thematic programming. He serves as artistic director for AME as well as house composer, frequently contributing new pieces to the ensemble, and he directs the affiliated record label, American Modern Recordings (AMR), which is distributed by NAXOS. 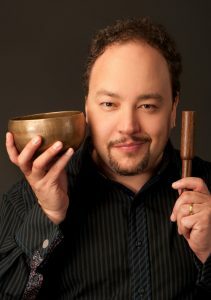 He holds degrees from the Eastman School of Music (BM), Indiana University (MM), and Cornell University (DMA). Paterson gives master classes at numerous colleges and universities, most recently at the Curtis Institute of Music, Aspen Music School & Festival, the University of Illinois Champaign-Urbana, New York University, and the Cleveland Institute of Music. He resides in New York City with his wife & violinist, Victoria, and son, Dylan, and summers in Saratoga Springs, New York, where he is the director of the composition program and founder of the Mostly Modern Festival.